Many SMBs and home offices are walking away from their traditional phone service (AKA POTS) and embracing VoIP for its functionality and ability support their growing (and demanding) business needs. Traditional phones systems can be complex and expensive. VoIP technology allows companies to cut costs, make offices and employees more efficient, and simplify IT management. Business VoIP delivers a complete office phone system including voice, dozens of Fortune 500 features, and IP phones for one low price (depending on your needs, many providers offer both an unlimited calling and metered/pay per minute plans). 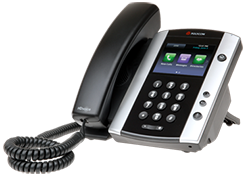 Business VoIP is a hosted PBX solution that uses the Internet to transit calls. VoIP technology converts voice into little packets of data so that it can be sent over the Internet using high-speed or fiber connection. Saving money does not only mean getting great deals and discounts. It also means making smart business decisions that can save you more (both money and headaches!) in the long run. Lines and Service Fees - Business VoIP uses the Internet to transmit calls, which is significantly cheaper than standard phone lines (which average $50/per line per month). This doesn’t include any hardware or maintenance fees. With a business VoIP solution you’ll typically pay $24.99 per extension per month for an unlimited calling plan (and as low as $12.99/month for a metered plan), and $34.99 for unlimited calling and rental of an IP phone. Hardware - Voice is provided over an IP backbone ("the cloud"). Since both the service and PBX are fully managed (“hosted”) off-site, companies don't have to install and manage complicated and costly equipment. Support and maintenance fees – Since the PBX does not reside at the customer’s location, any upgrades and updates are automatically provided by the service provider in the background so there aren't any costs to you. VoIP grows as your business grows. Unlike traditional phone service, VoIP allows you to quickly (and inexpensively) add or remove users (lines), and enable and disable features as needed. While cost savings is a motivating factor for making the switch, business VoIP also allows businesses to connect remote employees and multiple locations under one calling group. Business VoIP delivers big business presence on a small business budget. You don’t have to break the bank to receive dozens of Fortune 500 features like Find Me Follow Me, Auto Attendant, Hunt Groups, Conference Calling, Hold Music, Time of Day Routing and much more. Even the smallest companies can look bigger and sound more professional overnight. Many companies have already adopted VoIP technology to lower their overall office expenses, for its ability set up quickly and easily, and for its flexible configuration. We understand though that it can be difficult to make the switch to something unfamiliar. If you have any questions about business VoIP, one of our VoIP Specialists will be happy to assist you. To speak with a VoIP Specialist call 1-800-900-5474, or e-mail business.support@touchtone.net.